Last year in this space I bragged on my daughter's prize winning garlic. Jen planted her seed garlic in late October 2010; the garlic scapes formed this spring, making their other-worldy swoops and curves. They were ready to cut yesterday, July 4th. Too bad we had to leave before we ate any in one of her fabulous dishes. Jen thought the other passengers on the Concord Bus Line and the Acela from Boston might object to the scent if I tried to bring some home to New York. I did get to try one scape as an earring and a bracelet. Sorry, no picture. 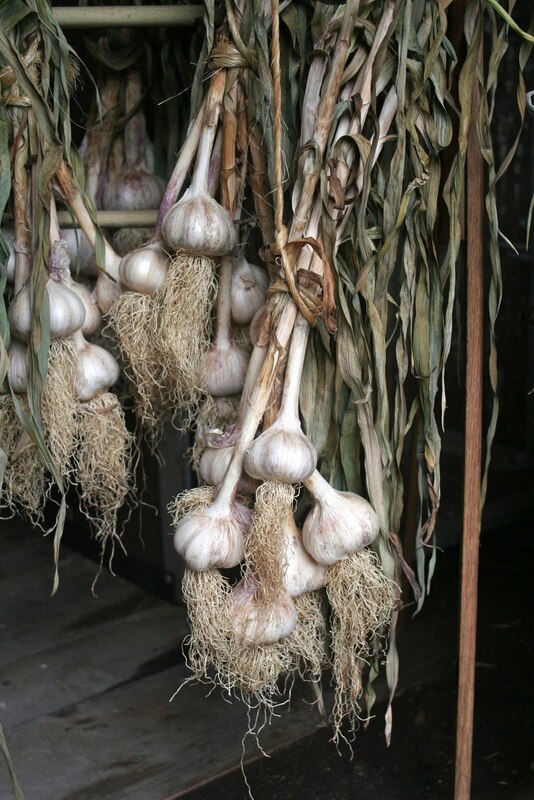 The garlic plants will continue to grow, with all of the energy now going to enlarge her prize-winning garlic cloves rather than to forming seeds in the pods atop the scapes. Jen had a nice basketful... which she'll chop and use in stir fries. What she doesn't consume in the next few days she'll chop and freeze to use by the handful (or tablespoon full) in the next months. The raw tasty is garlicky, tangy and intense. Above, her harvested garlic last August. Jen's friend Abby provides a recipe for using the fresh scapes on her blog, Killer Delicious. 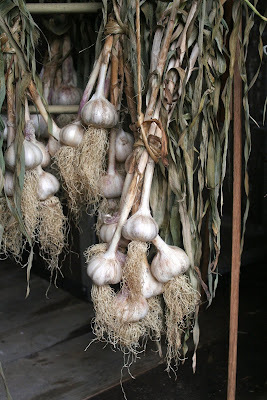 For more about growing, cooking and decorating with garlic see my book, "Garlic, Onions and Other Alliums" by Ellen Spector Platt, Stackpole Books 2003.
great to have you here in garlic season. It is almost time to harvest. Mary pulled her softneck up this week,my hardneck must be next.